Our all-inclusive Destin wedding packages were carefully designed to offer you value, convenience and a stress-free experience. Choose from flexible Destin wedding packages for small to large weddings and receptions that begin at $2,300. Our award-winning wedding planning services are included in all packages so you have local expert eyes before, during and after your wedding. Leave your worries in our wake. Save time, stress and money by working with one company for all your Destin wedding needs. Together, we can plan your wedding (even a Destin Beach Wedding), yacht reception, flowers, catering, décor, rentals and coordinate with trusted, outside vendors. Our Destin wedding packages feature all-inclusive pricing with tax and service fees included so you know exactly what to expect. There’s nothing more romantic, private or unforgettable than getting married by a captain on a 125’ yacht while it cruises into the sunset. After preparing in your private bridal suite, you will ascend the staircase to meet your love on the bridal platform on the SOLARIS sky deck. Seal your romantic nuptials with a kiss at sunset and take amazing pictures on the sky deck photo platform. All-inclusive Destin wedding packages begin at $1,400. Whether you enjoy the convenience of starting your reception right after your yacht wedding or have us arrange the transportation to the yacht from your beach wedding, our wedding planners can make it happen. We can customize your all-inclusive Destin wedding package to make your day special and just the way you imagined. 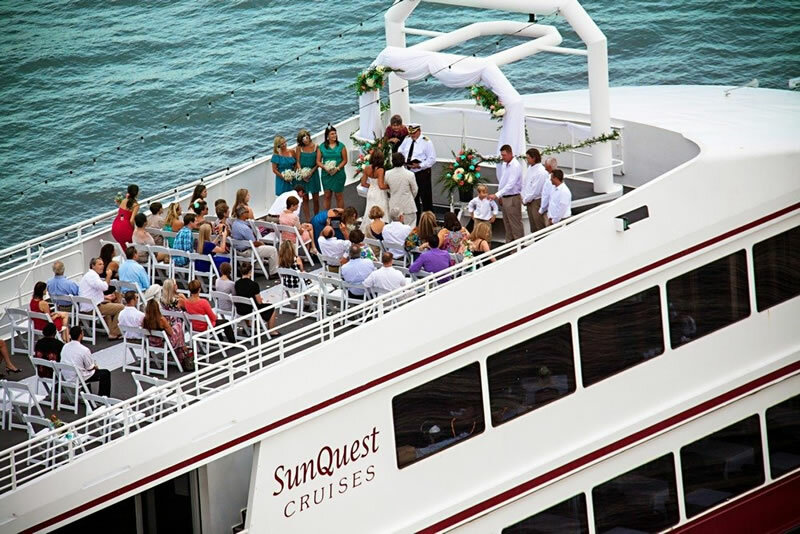 Your guests will dine, dance and cruise through an unforgettable reception. The SOLARIS offers 3 decks of indoor and outdoor spaces for up to 150 people, making it a convenient back-up venue in case of rain for your wedding and/or reception. SOLARIS yacht reception packages begin at $2,300. Enjoy the best of both worlds with a Destin Beach Wedding and a SOLARIS yacht reception. The beauty of our company is that we have the experience to plan a beach wedding followed by a reception aboard the SOLARIS yacht or another reception venue we have connections with. Our wedding planners offer a full-service wedding experience so you work with one company for a stress-free day. All-inclusive Destin Beach Wedding Packages begin at $500.